This is a sign that takes up shop area! 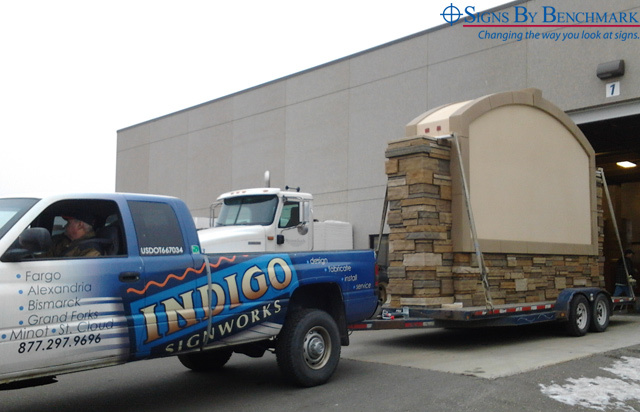 Measuring 12′ high x 20′ 2″ wide x 3′ 4″ deep, this custom monument sign designed by Indigo Signworks (Fargo, N.D.) for creation by Signs By Benchmark features faux split stone and enough copy space to very adequately advertise Lake Region College located in Devil’s Lake N.D. Although this is a custom sign, the design is based on our Signs By Benchmark Standard Model #2 featuring a classic keystone design. As with this project, all standard models may be customized to precisely meet the customer’s needs. Having collaborated with Indigo Signworks on many projects in the past, including the Hector International Airport sign, we were excited by this new project that called for another sign of epic proportions. 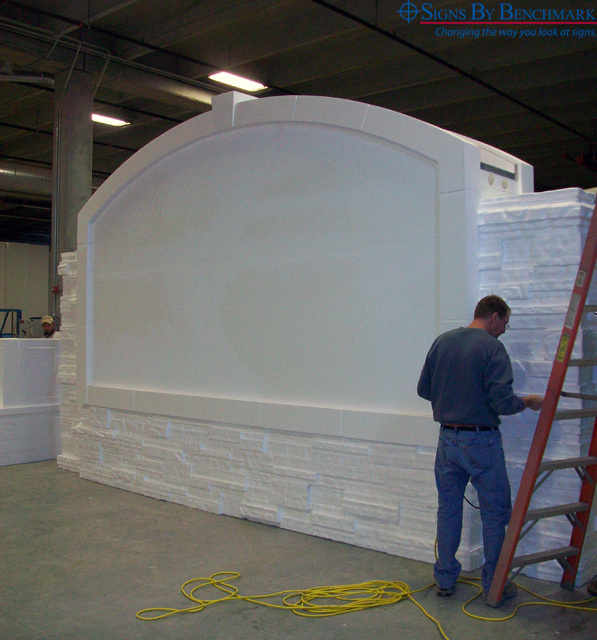 Created from cellular plastic (expanded polystyrene), the sign core was first CNC-cut, then finished out with hand-sculpted elements. Once all parts were assembled, the sign was coated with our signature polyurea hardcoat to ensure a seamless, durable, long-lasting product. Scheduled for installation in December 2011, the sign was picked up from Signs By Benchmark by Indigo Signworks during mid-December. Return to our “NEWS” articles on our website (www.SignsByBenchmark.com) in late December to read about the completed sign and its installation.